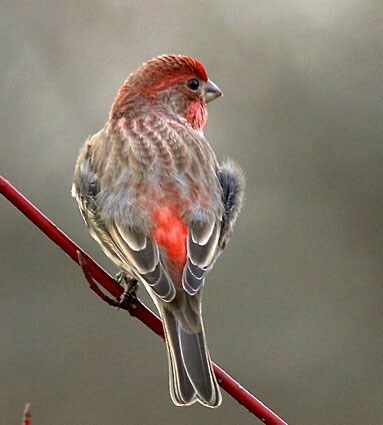 The most common backyard birds that come to visit, and often can be seen at bird feeders. Featuring a striking red breast and darker back, the robin is probably one of the most well-known birds in the United States. Most people view them as harbingers of spring, even though they don’t move far to the south for the winter, as long as they have ample food. These birds are active very early in the morning and their cheerful melodies can be heard with the first glow rising in the sky. They mostly eat on the ground and can commonly be seen grabbing earthworms in your garden. 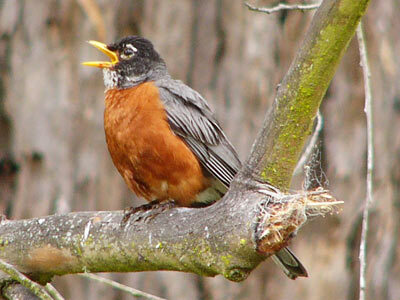 It is not widely known that the robin, just like the bluebird, belongs to the thrush bird family. A widely known summer bird. Both male and female members have green feathers with a white breast and belly, but males also have a striking red patch on their throats which is very easily noticed. Females do not have that patch. Their song is best described as high pitched raspy twitter. They construct their nests primarily from down, lichen and buds, which they cement together using stolen spider webs. 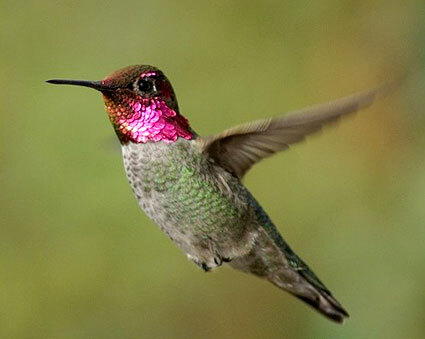 When flying, the heart rate of a hummingbird climbs to an outstanding 1220 beats per minute. 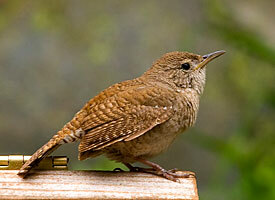 The house wren is one bird many of us have simply fallen in love with. This busy, never resting small bird draws our attention with its cheerful bubbling song. In contrast with their song, the birds are not very cheerful but rather grayish brown in color with some lighter abdominal feathers. However, this is one very friendly bird which lives near urban areas and will gladly make its nest in the boxes we provide for them. If there are other boxes or natural cavities in the neighborhood, the male will construct dummy nests in them, filling them with sticks and nesting material. 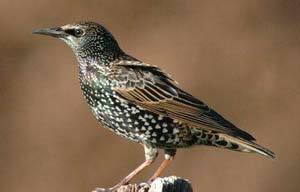 Starlings were completely unknown in the United States prior to 1880. A few pairs of birds were released in New York, and now they are virtually everywhere and are widely considered the greatest feathered nuisance. On first appearance they seem like black stubby birds with a short tail, but in fact they are purple and green in color with speckled plumage. Even though their own call is an ugly jittery squeaking sound, they are very skilled at imitating other birds. They are most hated in winter time, because then they gather in immense flocks which nest on buildings and in tree groves, making a lot of noise and filth. As their nesting time precedes most our local cavity nesting species, they tend to steal every hole or cavity and leave no nesting places for other birds. This bird is known by several different names like the house sparrow, the English sparrow and its proper name, the black chinned weaver finch. Hailing from Africa, this bird was introduced to the United States from England. History records that 8 pairs were brought to New York in 1850, but not a single bird survived. Another attempt was made two years later and today they are spread out across the United States. As their numbers grew, the house sparrow overtook our back yards and replaced the native bluebird as the most common guest at our nesting boxes. The male of the species is very colorful, featuring a black throat and chest, with white cheeks, a chestnut nape and gray crown. They do not have a melodic song but rather sound in long series of dull chirps. This chickadee species is one of the bird species which are present in our gardens the whole year long. 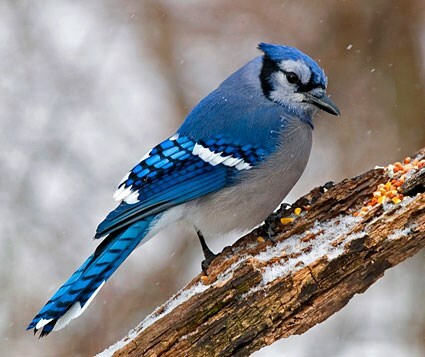 They are among most well-known birds, primarily because of their cheerful song and their friendliness. They are very attracted by suet cakes and peanut butter logs placed in feeders, and it is not uncommon for individual birds to become so tamed that they will eat from your hand. 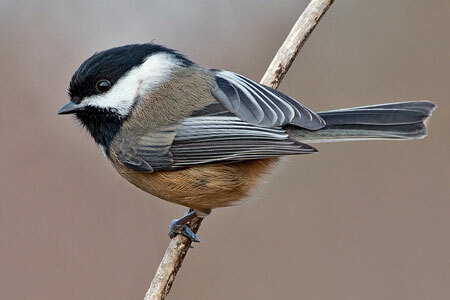 Chickadees always seem like they are in a rush, always hopping from one branch to another. They are well known for their acrobatics, and are commonly seen hanging upside down or in other weird positions. They are very easily recognized because of their black caps and white cheeks. The common name for this bird is “redbird” and its color is enough to make it your favorite bird. No other redbird features a crest, black face and prominent orange bill. Although they are usually gentle and mild, these birds will sometimes in early winter chase other members of the species from feeding places. But, by late winter and spring, they are back to their usual gentleness and eat side by side. 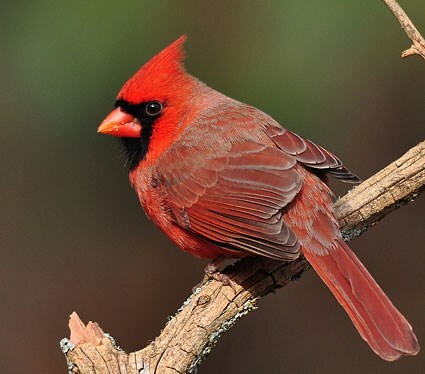 Cardinals live in various habitats, nesting anywhere from gardens to forest thickets. Their winter food is mostly seeds and berries, but during the summer they usually only eat insects. Most hated and most admired among birds. Although they can be very loud and aggressive hustlers, when they are around their nests they tend to be docile and revert to gentle and musical sounds. Very easily identified by their bright blue and white color, with a noticeable crest on the head. These birds are true aggressive bullies at the feeder, and they show their abusive character especially during mating season, by destroying nests of other birds and eating both eggs and young birds of smaller species. When they have eaten enough they tend to rob the feeding station of excess seeds and nuts, and bury them under leaves. As most of those are never eaten, they grow into new trees or bushes. The male member of the species features dark blue, almost black plumage which at times appears purple. 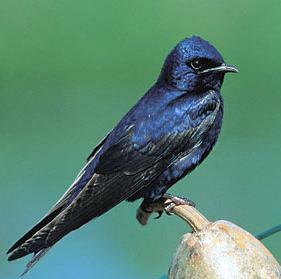 This bird is the largest in the swallow family, and like all swallows, it nests in colonies. They love the many roomed houses which we put up for them. Most bird lovers especially enjoy watching the graceful aerial show of these large colonies. When flying, these birds sound a low gurgling sound by which they are identified. They usually return from wintering south very early in spring, and are usually all back by late March. Late snows can cause them serious harm, as many starve and die if the snow kills their food source of flying insects. During summer, they nest only once and leave back for South America as soon as their young have fledged. Nobody understands why they migrate so early, because at the time the food supply is still abundant. 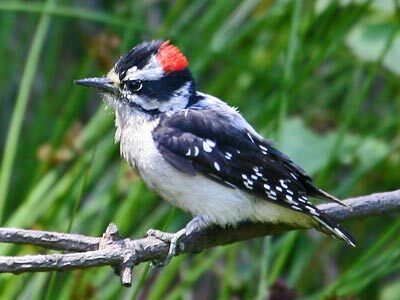 The smallest of our resident woodpecker species, downy woodpecker is similar to its larger cousin, the hairy woodpecker. It features a little softer sounding call and a little more rapid tapping enabled by a shorter bill. While the hairy woodpecker has white outer tail feathers, those of the downy are barred. Males of both species feature a vivid red spot on the nape which the females lack. Both species are generally black and white. This cheerful little woodpecker enjoys servings of suet, but also eats sunflower seeds and peanut butter. They got their name because they also eat insect larvae which they chisel out of galls on weed stems or from soft branches of trees. Our forefathers discovered, upon arriving to the United States, that bluebirds can be attracted to gardens if provided with nesting boxes. The close relationship between bluebirds and humans lasted until 1850ties, when the house sparrow was introduced to the United States. They soon replaced bluebirds in nesting boxes, and the bluebird was forced back into the wild. Nesting boxes in the countryside are widely still occupied by bluebirds. Differing from most birds in the thrush family, bluebirds do not have a melodious song, but rather a friendly call “fur-wee” which seems to offer an assurance that all is well. The male of the species features a striking blue upper back, head and tail, while its breast is reddish and brown, similar to its cousin, the robin. 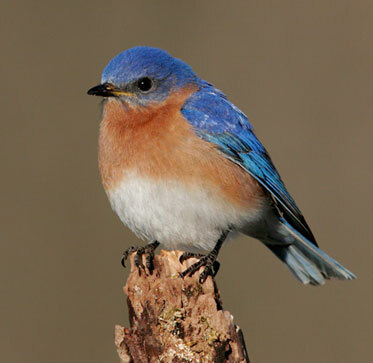 Most bluebirds do not migrate far in winter, so they are seen in great flocks feeding on berries, mostly juniper. Bluebirds commonly roost in communities, with many members huddling inside cavities and nestboxes. The male of the species features a recognizable warm lemon yellow color with a black mask above the bill, and black covering on the wings and tail. The wings also feature white stripes, which are more visible during winter when the yellow coloring fades to a yellowish brown. The folk name for this bird is wild canary. Although they are not related, their small size, coloring and twittering sounds reminds people of the pet birds. These are hardy little birds which mostly spend their winters in their nesting range. 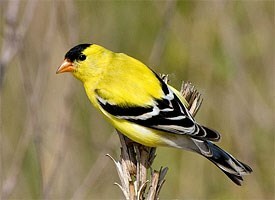 They are easily found because in winter they gather and feed in flocks which are noticeable in gardens and at feeders. Their flight pattern features deep undulations, each dip accompanied by a tsee-tsi-tsi call. 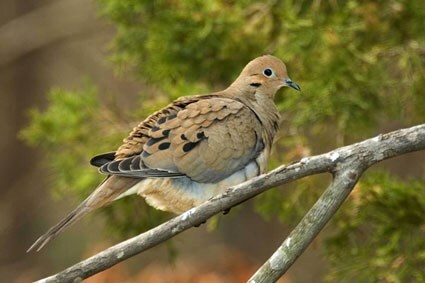 This is a medium sized dove species which features gray and brown feathers with buff brown underparts, small dark eyes with a characteristic black spot under them and a dark gray bill. Their wings are mostly gray with black spots and dark primaries. The tail is long, pointed and the outer feathers have white tips with black edges. Members of both sexes look similar. These doves have a much ranged diet, consisting of various seeds, waste grains, fruit and insects. Ground seeds are their favorite, but they will move to the trees and bushes if ground seeds become scarce. Very rarely, these birds will also feed on grasshoppers, beetles, ants and snails. 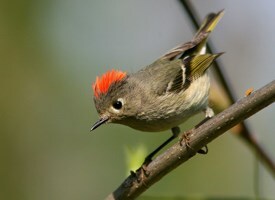 This is a medium sized member of the kinglet family which features olive green feathers and washed out gray and yellow underparts, with a tuft of red feathers on the crown of its head and white glasses around its eyes. Wings are mostly darker in color, but show two white stripes, while the tail feathers are white edged and notched. The female of the species doesn’t have the striking red crown. This bird mostly eats insects, insect eggs and larvae which it finds on tree trunks and branches. It also feeds on some seeds and fruit. These birds typically construct their nests in conifer threes, high from the ground and close to the tree trunks, suspending it from twigs below another branch for shelter. They lay from five to eleven eggs which are creamy white with gray and brown splotches. The incubation period is about 13 days and is completely handled by the female. Their flight pattern can best be described as weak fluttering with very shallow beats. Their breeding grounds extend all the way from Alaska across Canada and Newfoundland to the Great lakes region and New England, while stretching south to California and New Mexico. They spend winter time south of British Columbia and California and all across the southern states, even flying to southern England. While they spend their summers in coniferous forests, in winter they can be found in deciduous forests as well. This medium sized warbler features blue gray upperparts with dark streaks and a bright yellow rump, and while its throat and belly are stark white, the breast is contrast black. Its black head shows a yellow crown and white rings around its eyes. Wings are mostly dark but feature yellow patches on the shoulders and two white stripes. Tail is dark gray with white corners. The female of the species is duller in color and has streaks on its sides. Young birds generally resemble the females but without the yellow markings. Their diet mostly consists of insects in the summer and berries in the winter. They are unique in their ability to eat wax coated berries such as bayberries, thanks to a specialized gastrointestinal system. They construct big nests in conifer trees, and they are made out of roots, twigs and grass lined with hair and feathers. Usually there are four or five white eggs with brown spots, which incubate for 12 days. Only the female cares for the eggs. Their flight is very rapid with quick and short wing strokes. 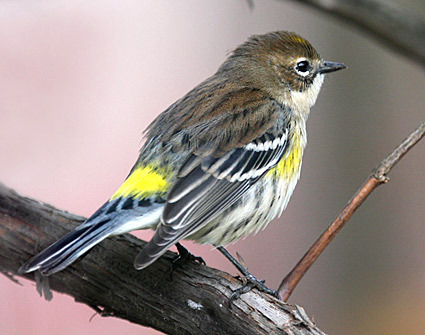 The warbler breeds from northern Alaska, Manitoba and central Quebec to south Newfoundland, stretching to northern Mexico and Michigan, New York, Massachusetts and Maine. They spend their winters in the tropics, starting their migration south slowly in the autumn. Highly adaptable, this bird lives in various different habitats which include both coniferous and deciduous forests, pine plantations, bogs, and open spaces. In winter it’s common to see them in thickets of bayberry and wax myrtle because they feed on them. 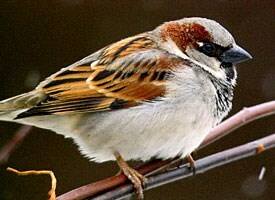 This medium sized finch features wings and back with brown streaks, while its underside is streaked with white. It is easily recognized by its pink head, throat and rump. It has a long, slightly notched tail. The females are duller, with overall gray streaks and brown coloring. This finch differs from other members of its family by foraging on the ground. They will only feed off the ground if covered perching sites are available. This bird feeds exclusively on vegetation. They mostly eat seeds – dandelion, sunflower, thistle and mistletoe, as well as the buds of these species, while they sometimes supplement with cherries and mulberries. They construct their tightly woven nests in cavities, bushes or on buildings. The nests are constructed by the female from twigs, grass, leaves and debris, and the female takes care of the eggs. She usually lays three to five bluish spotted eggs, which incubate 12-14 days. Their flight is very swift and bounding, alternating periods of rapid beats with periods of wings tightly pulled to the body. They are resident birds of the west, ranging from southern Canada to Mexico, and stretching east as far as Nebraska. There have been attempts to spread it to the east and they are now common in cities and residential areas. In the native west, they mostly nest in deserts, orchards or coastal valleys once having redwood or cedar forests but now converted to suburban residential areas. They prefer the ground and platform feeders. 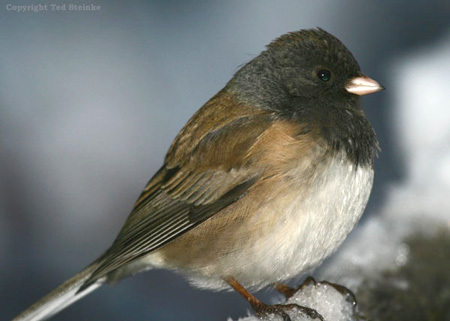 Juncos are also known by the moniker “Snowbird” for two reasons. First, they are far more common on feeding sites during snow periods, and second, they usually come from their far northern breeding areas in advance of much colder weather. Juncos are one of the most common feeder birds across North America, reported at more than 80 percent of Feederwatch sites. This sociable bird spends winter time in large flocks up to thirty birds which stay together that whole season. The flocks are hierarchical in organization, with dominant birds getting the most time at a feeding site and having to spend less time on watch duty. On the top of the hierarchy are adult males, which are followed by young males, adult females and young females are in the bottom. They prefer striped and black oil sunflower seeds, served in hopper, platform or tube feeders. 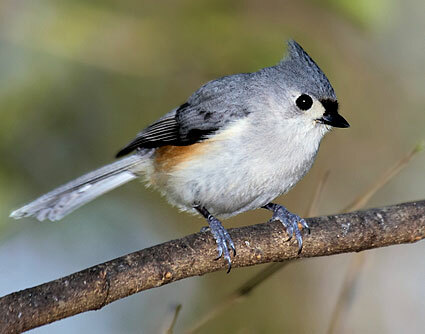 Tufted Titmice do not migrate but are permanent residents of their territory and are very territorial. For this reason, only a few members will visit the feeder at the same time. Their territories are continually expanding northward and this may be, in part, due to the growing number of feeding places.